Stir together ground cinnamon, ginger, turmeric, pepper, 1 teaspoon salt, and 2 tablespoons oil in a large bowl. Add chicken and turn to coat well. Heat butter and 1 tablespoon oil in base of tagine (or in heavy skillet), uncovered, over moderate heat until hot but not smoking, then brown half of chicken, skin sides down (if it has skin), turning over once, 8 to 12 minutes. Transfer to a plate. Brown remaining chicken in same manner, adding any spice mixture left in bowl. Remove chicken and leave juice in the pan. Add onion and remaining 1/4 teaspoon salt to tagine/skillet and cook, uncovered, stirring frequently, until soft, about 8 minutes. Add garlic and cook, stirring occasionally, 3 minutes. Add cilantro/coriander and parsley to tagine along with 1/2 cup water, chicken, and any juices accumulated on plate. Reduce heat and simmer on low, covered, 30 minutes, stirring occasionally to make sure it's not sticking to the bottom. While chicken cooks, bring honey, remaining cup water, cinnamon stick, the optional chili and apricots to a boil in a 1- to 2-quart heavy saucepan, then reduce heat and simmer, uncovered, until apricots are very tender (add more water if necessary) and liquid is reduced to a glaze, about 20 minutes. While apricots cook, heat remaining 1/4 cup oil in a small skillet over moderate heat and cook almonds, stirring occasionally, until just golden, 1 to 2 minutes. Transfer with a slotted spoon to paper towels to drain. Once the chicken has cooked on its own for 30 minutes, add apricot mixture (discard the cinnamon stick) to chicken. Cook for another 15 minutes or so, allowing apricot mixture to caramelize a bit. Then serve chicken sprinkled with almonds on top. Serve with cous cous, flatbread, hummus and/or greek yogurt. 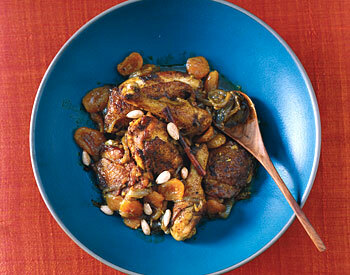 Apricots and chicken make such a lovely combination - this is definitely getting saved in my to-make file! Weigh-in no. 23 & Winner of CSN Giveaway!